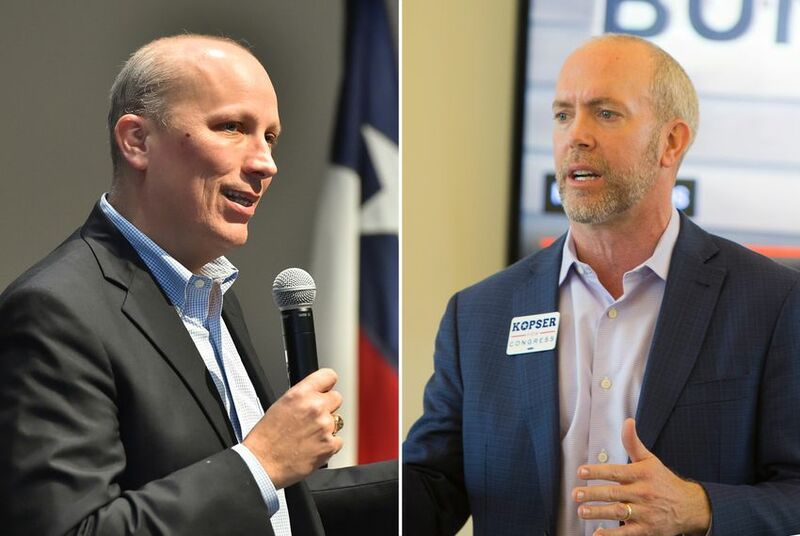 The race for Texas' 21st Congressional District pits Democrat Joseph Kopser against Republican Chip Roy for the seat being vacated by retiring U.S. Rep. Lamar Smith, R-San Antonio. National Democrats' congressional battlefield in Texas has grown this election cycle to include eight districts, an unprecedented number in recent memory that reflects the party's bullishness on a changing landscape here. Democratic presidential nominee Hillary Clinton won three of those districts in 2016, instantly ensuring they would be in contention this year. The remaining five, though, are more challenging opportunities, and among them, the 21st District stands out. Stretching from Austin to San Antonio and out to the Hill Country, the district has been represented since 1987 by U.S. Rep. Lamar Smith, R-San Antonio, who easily won term after term. Now, with Smith retiring, the 21st District has turned into a second-tier battleground that could test just how justified Democrats have been in compiling such a lengthy target list. After crowded, spirited primaries on both sides — the Republican field started with 18 contenders — the major parties have put forward candidates with similarly compelling profiles. The GOP nominated Chip Roy, a longtime adviser to Republican officials, including U.S. Sen. Ted Cruz, who preaches the limited-government gospel that has long resonated in bright-red Texas. The Democrats, meanwhile, picked Joseph Kopser, an Army veteran-turned-tech entrepreneur who cuts the kind of image that many in his party believe is essential to wrangling districts like the 21st out of GOP hands. Even Smith acknowledges Democrats have put forward a "strong candidate" in Kopser, who has consistently outraised Roy. But in an interview, the outgoing congressman echoed an argument that is being made against Democrats making competitive races out of traditionally Republican districts across the state: At the end of the day, the district is still just too conservative to elect the guy, however nice he may sound. "He’s just taken such a hard left position on almost every issue," Smith said in an interview. "He can try to make himself sound moderate, but when you look at his positions on the issues, he is very liberal, and that is not a good fit, in my opinion, for the 21st Congressional District." Kopser maintains that his views on some key issues, such as immigration, have resonance with Republicans who have been repelled by their party's rightward lurch in recent years. Even back in his primary, when he was getting battered from his left, Kopser spoke openly about the need for the eventual Democratic nominee to be able to appeal to the GOP in a district like the 21st. And he has followed through on that in the general election, airing a TV ad in which he touts having "voted for people from both parties" — including President Ronald Reagan — and invoking retiring House Speaker Joe Straus, R-San Antonio, the patron saint of disenchanted Texas Republicans. "Those moderate Republicans, those Ronald Reagan Republicans, are just shocked and outraged with the way their party is going — to the point it would censure Joe Straus," Kopser said in an interview, referring to the Texas GOP's controversial move against Straus earlier this year. Roy is not short on reasons why he believes Republicans should not be fooled by Kopser. On immigration, for example, he believes the district will ultimately agree with him that border security should be prioritized before any talk of how to deal with the people already in the country illegally. That approach to the issue is abundantly clear in Roy's opening TV spot of the general election, which warns of the threat of "porous borders, gangs and drug cartels." Debates have been mostly civil, and neither candidate appears to have run a negative TV ad against the other. "I believe that my record speaks for itself," Roy said in an interview. "I believe that positions are my consistent with the electorate in the 21st Congressional District, and I think that’s where the voters will be." If Roy wins, he is expected to quickly carve out a distinct role in the delegation. He has pledged to join the very conservative House Freedom Caucus and he supports its founding chairman, Jim Jordan, for U.S. House speaker. A recent Politico profile declared Roy the "next Ted Cruz" — a title Kopser was happy to promote in his drive to paint Roy as too extreme. Kopser was the first Texas candidate that the Democratic Congressional Campaign Committee added to its Red to Blue program outside the contenders in the three districts that Clinton carried, putting him on the list days after Smith announced his retirement last year. But the DCCC has not invested in the district since then, and other Democratic groups have largely stayed out. On the Republican side, the Club for Growth, the national conservative group that spent heavily to help Roy win the nomination, is waging a homestretch offensive against Kopser, airing $200,000 worth of TV ads in San Antonio labeling him a "liberal Democrat." Kopser has been heartened by the attack, taking it as evidence that the race is not nearly as sewn up for Roy as was indicated by a poll the Club for Growth released a few weeks ago. It had Roy leading by 12 percentage points. As the race winds down, Democrats acknowledge the 21st District is not among their easiest pick-up opportunities in the state. But Kopser, they argue, has run the kind of campaign that can make Republicans think twice about taking the district for granted in the future. "He's not just a Democrat hitting on the Democratic issues — he's really reaching out, and I think he has a unique background to do that" as a veteran and businessman, said Donna Haschke, the chairwoman of the Hays County Democratic Party. "If anybody can make some major inroads in that district, it's him."